So here we are… The eve of a new year. I took the time to go back and read through some old entries, and it was strange to see the places I have been. If I had to give 2011 a word: Growth. When I take that all in. I’m impressed. Contrary to the self absorbed nature of blogging, in real life I HATE talking about myself. Even if I’m confident in a talent, my knowledge, my character, I wouldn’t say so. But this place is all mine, even if others get to read it. So I’ll say it. I’m proud. I couldn’t have foreseen the things I faced, but I handled them. I made it through, with my head high. I struggled, but I survived. I had great highs for every low. It was a good year and I’m hoping for another. So here’s to that! This cycle never ends. Gotta fall in order to mend. Whoaaaaa. I can’t believe I left that last post up for so long. Sorry for that… if anyone is even still reading this. The fall semester is over for all intents and purposes. I just have 3 final exams over the next week. I can’t believe I made it. There were points where I hit lows I didn’t feel I could recover from. So much changed from my community college life to the 4 year school I’m currently attending. It’s been difficult. I miss the closeness, the “community” of it all. One thing I’ve discovered this semester is a certain skill with 3-D art… I thought my final piece in particular would be of interest to the DOC. It’s a body extension sculpture. 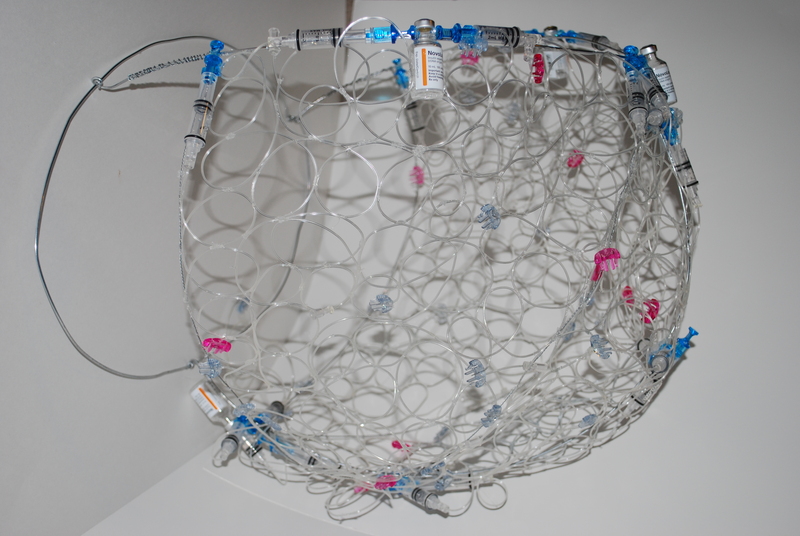 Basically, I created a hood from insulin pump tubing, insulin bottles, and cartridges. The hood restricted the movement of my arms and required some balance to keep steady; restriction of diabetes. The supplies surround my head as a symbol for the way diabetes is always on my mind and impacts my decision making. I even left one tube hanging and connected it to my pump site during the presentation. It was a great success. A lot of the feedback included how delicate I was able to make the materials seem and the contrast between that and the harshness of the medical condition. One of my classmates even said something to the effect of “it’s so pretty, but it kind of freaks me out”. Mission accomplished. I’ll be back over break. I’m hopping back into this blogging game. Happy Holidays!